The location of the new Perth stadium has today been confirmed. 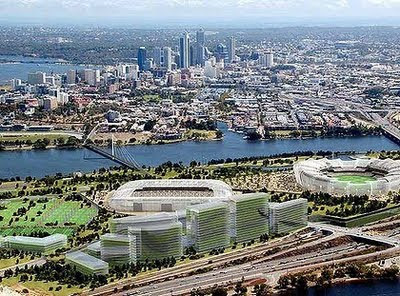 The Burswood area, to be renamed in the future to Eastside, will host Eagles and Dockers games as well as international rugby and possibly soccer games. There are plans to build a footbridge across the Swan River and to build a new train station which will feed into the four main train lines in Perth. The seating capacity of the new stadium is tipped to be 60,000 with the option to expand that to 70,000 with the new stadium opening 2018.